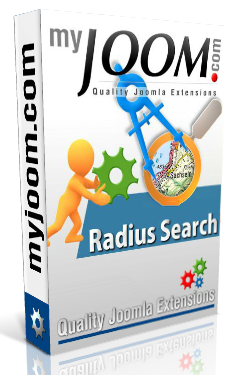 The MyJoom Radius Search Plugin for Community Builder allows you to add a field into the native Community Builder search function. This field allows the user to enter any type of address (street and/or city and/or ZIP and/or any data that can be located in Google maps). Once the user start to type a place name, the fields try to complete the user’s query (exactly like the maps.google.com search input box). You can also locate the user at page load to geocode their position (useful for mobile users like iPhone, iPad, Android and newer browsers). You can search just by radius distance or with any combination of native Community Builder search criteria. After the center point is entered, the user selects a radius. The radius select box can be customized in the administrator panel with your own comma-separated list of distances in the units you define (kilometer, miles, nautical miles). Requirements: your CB profiles need to be geocoded, this mean having longitude and latitude. One way to do this is to use the Geocode Factory batch tool. In order to work, Community Builder Radius Search plugin needs to have geocoded profiles (with latitude and longitude). For this you can use any custom fields of course the Geocode Factory Batch geocoder is a great option for this. Finally, you can optionally display the search results on Geocode Factory maps. In this case, the Community Builder Gateway plugin is also required.